Was one of your family New Year's Resolutions to read more? Well, I've got a pretty fantastic new book to tell you about. Microsaurs is probably one of the more adorable reads our family has had the chance to review. And here's why my boys are loving it! 1. The chapter book series is written and illustrated by a video game developer, which means that he knows what kids like! Dustin Hansen has perfectly captured the kind of story development and action that keep young readers in the pages of the book -- and feeling like they are part of the excitement. 2. Boys will be boys. 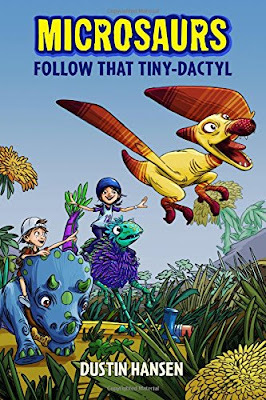 Yes, girls may like this book, but with dinosaurs, skateboarding and tech gadgets filling the pages of these stories, young boys just can't ignore the Microsaurs books. They are great for the reader who is reluctant and unsure of his readiness. In the first book, Microsaurs: Follow That Tiny-Dactyl, characters Danny and Lin find and follow a cute and tiny pterodactyl to a secret lab. They become shrunk down to a tiny size, too and are then emerged into big adventure among the smallest dinosaurs ever! This book isn't just a story, however. It also contains facts on dinosaurs and teaches kids in a way that they probably won't even realize that they are learning. It's part science, part crazy adventure.. it's perfect for my own book-loving daredevils at home. The next book in the series is set to arrive in July. It's called Microsaurs: Tiny-Raptor Pack Attack, and my boys can't wait to see what the characters get up to next! Wanna Win? We are giving a lucky reader a copy of the book, as well as some fun Microsaurs goodies! To be entered to win, just use the form below by February 5th at 11:59 pm EST. Open to U.S. residents 18+. *Sample book received to review. Opinions are my own.